Congratulations to Qiang Lin, assistant professor of electrical and computer engineering and optics at the University of Rochester. Qiang has been named the first Leonard Mandel Faculty Fellow. The award recognizes exceptional achievement by a junior faculty member in coherence and quantum optics. Lin received his Ph.D. in 2006 from the Institute of Optics, where he worked as a graduate student in the laboratory of Govind Agrawal. “He published 30 research papers before graduating, a record that is unlikely to be broken,” said Agrawal, the James C. Wyant Professor of Optics and professor of physics. Optics is cool. And hot as a matter of fact! Congratulations to the College of Optical Sciences at the University of Arizona on their 50th anniversary! Congratulations to Julie Bentley, Associate Professor of Optics, who is one of three recipients of the University's 2014 Goergen Awards for Excellence in Undergraduate Teaching! Michelle Relin, who has played field hockey since 7th grade, always dreamed of being a college athlete. That dream has come true – and how. When she scored two goals and assisted on another during a recent game against St. Lawrence, she became UR’s all-time leading field hockey scorer. (Read more here.) On the other hand, Relin didn’t know anything about optics when she arrived here as a freshmen, but she’s hoping to make a mark in that field as well. Per Adamson, director of the teaching labs at The Institute of Optics, was honored last night at the Hajim School's 2014 Annual Fall Reception with the Outstanding Staff Award. Congratulations! Jonathan Ellis, Assistant Professor of Mechanical Engineering and of Optics, is co-PI on a just-funded Small Business Technology Transfer (STTR) Phase I grant from the National Science Foundation. This fall we are holding our Industrial Associates meeting from Sunday, October 12th through Tuesday, October 14th. The director of the Institute of Optics, Prof. Xi-Cheng Zhang, extends a warm welcome to the incoming optics students. This summer, Pedro Vallejo Ramirez, a rising junior at the Institute of Optics submitted a proposal for a project to showcase the power of sunlight using optics in the International Year of Light (2015). The Institute of Optics held its second annual Photon Camp last week, with 18 students from several local high schools and the Bergen Academy in New Jersey attending lectures in the mornings, and getting some hands-on experience in the laboratory during the afternoons. The students, who also worked on weeklong projects, toured local company Optimax, the Laboratory for Laser Energetics and the Robert E. Hopkins Center for Optical Design & Engineering. This is another example of the Institute's efforts to attract top students to its undergraduate program. Congratulations to staff members Dan Smith and Per Adamson, lecturer Brian McIntyre, faculty members Jim Zavislan, Nick Vamivakas, Wayne Knox and Julie Bentley, Alexis Vogt and Jim VanKouwenberg of the faculty at Monroe Community College, and Optics students Sarah Bjornland, Lauren Brownlee, Jiashi (Maggie) Han, David Manly, Rebecca Pettenski, Sean Reid, Ray Lopez-Rios, Michelle Relin and Katelynn Sharma -- who served as mentors or gave presentations -- for helping to make the camp a success! During their week at Photon Camp, 18 students from several local high schools and the Bergen Academy in New Jersey will attend lectures in the mornings, and get some hands on experience in the laboratory during the afternoons. Students will also have a chance to tour local company Optimax and the University’s Laboratory for Laser Energetics and the Robert E. Hopkins Center for Optical Design & Engineering. Congratulations to Anthony Yee, an Optics Ph.D. student working with Prof. Duncan Moore. 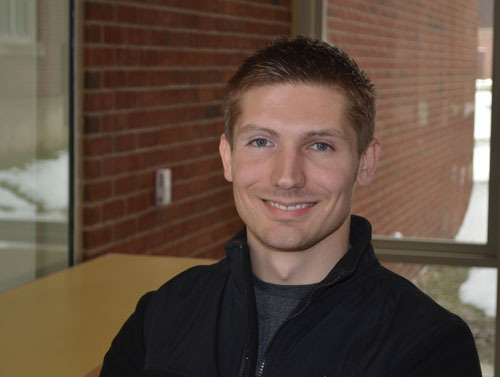 Anthony is a recipient of a 2014 National Science Foundation Graduate Research Fellowship. Kari Brick joins us June 16 as the new Graduate Program Coordinator at The Institute for Optics. Kari comes to us from Binghamton University where she has been a resident director. She previously worked at Canisius College in the Office of Graduate Admissions, and as an international peer mentor and interim director of community service. She was also an academic mentor at Buffalo State College. Let's extend a warm welcome to Kari! Ovitz Corporation, whose officers and team members include Hajim students Joung Yoon (Felix) Kim, a senior in Optical Engineering; Pedro Vallejo-Ramirez, a sophomore in Optical Engineering; Samuel Steven ’13 (Optical Engineering), a master's student in the Technical Entrepreneurship and Management program; Aizhong Zhang, a TEAM master's student and PhD candidate in Optical Engineering; and Len Zheleznyak, a PhD student in Optical Engineering, won the grand prize of $50,000, including $25,000 cash, at the 2014 Rochester Regional Business Plan Contest on Friday. And that's not all; the Ovitz team took second place and $5,000 in the Biotechnology/HealthCare category at the New York Business Plan Competition finals held recently. Ovitz has developed a hand-held instrument to determine an accurate prescription for corrective lenses. David Williams, Professor of Medical Optics and one of the world’s leading experts on human vision, has been named a member of the National Academy of Sciences in recognition of his distinguished and continuing achievements in original research. The honor is one of the highest given to a scientist in the United States. Alex Iacchetta, a Ph.D. student working with James Fienup, the Robert E. Hopkins Professor of Optics, has received a 2014 NASA Space Technology Research Fellowship for his proposal, "Astro-Interferometric Modeling and Spatio-Spectral Reconstruction," in concert with activities at the Goddard Space Flight Center. The fellowship, worth about $68,000 a year when stipend and various allowances are included, is for one year, renewable for an additional two years. Kudos to Professor Fienup as well, for a string of outstanding student accomplishments coming out of his lab. The purpose of the Photon Cup is to bring together optics undergrads, grads, faculty, and staff in a common pursuit to build meaningful relationships outside of the academic setting. During the preparation for and the soccer game itself, strong bonds were formed within our department, creating team spirit and fostering the idea of an "Optics family". Winning is only a secondary goal (and we all know that penalty kicks are almost like the lottery, right? ). The optics team showed an extraordinary display of spirit and teamwork in the field today, and for this we applaud everybody! We are pleased to announce that the Institute of Optics is offering a Photon Camp in 2014 as well. After last year's huge success (see the blog here), the camp is slated to be run from July 7th through 11th from 8:15am to 4:15pm each day. The Optical Society (OSA) just announced the names of the 2014 recipients of its prestigious awards and medals. The winners include The Institute of Optics' Prof. Jannick P. Rolland who will receive the David Richardson Medal for significant contributions to optical engineering, primarily in the commercial and industrial sector. Jannick is being recognized for visionary contributions and leadership in optical design and engineering, enabling noninvasive, optical biopsy. She and the other award winners—hailing from seven different countries—join an esteemed group of past recipients recognized for their sustained excellence in the field of optics. Daniel Savage of The Institute of Optics has been accepted by the UR School of Medicine and Dentistry into the Medical Scientist Training Program. This NIH-sponsored program trains outstanding students to undertake careers in biomedical research and academic medicine through an integrated program of graduate training in the biomedical sciences and clinical training. Graduates receive the combined M.D.-Ph.D. degree, and many of them pursue careers in basic biomedical or clinical research. Daniel would be the first student in the Institute's history to earn a Ph.D. and M.D from the University of Rochester. That will be quite an achievement! Agenda for Industrial Associates Spring meeting is now posted! The Spring 2014 meeting will be held in its traditional two-day format with talks, posters and company presentations, followed by an evening reception on Monday, March 3 and an interview session on Tuesday, March 4, where Industrial Associates will have the opportunity to interview interested Optics students. Interviews will be conducted on campus in Goergen Hall on that day. The director of the Institute of Optics, Professor Dr. Xi-Cheng Zhang has been elected to the grade of Fellow of SPIE. Dr. Zhang received his recognition and plaque at the Photonics West Fellows Luncheon on February 3, 2014 in San Francisco, CA. Congratulations! Here’s good news from Robert Boyd, Professor of Optics and of Physics, and his lab team: Dr. Boyd has been elected a Fellow of SPIE, the international society for optics and photonics, for his achievements in nonlinear optics. To see the official press release, click here.